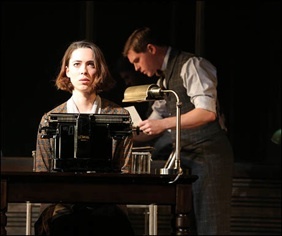 The Roundabout Theatre Company is currently staging the first revival on Broadway of Sophie Treadwell’s Machinal since the play was first presented there at the Plymouth Theatre in 1928. The production is a triumph for all concerned. It should prove to many that others besides Eugene O’Neill were writing great American plays in the 1920s and that some of the most important work was by women. Sophie Treadwell (1885-1970), playwright, journalist and actor, was inspired to write Machinal when she saw the now-famous photograph of convicted murderer Ruth Snyder (1895-1928) in the electric chair on the front page of the New York Daily News on January 13, 1928. Snyder and her lover Judd Gray, executed just before Snyder, had conspired to murder Snyder’s husband to collect on his health insurance policy. From this sordid news item Treadwell develops a general critique of women’s place in society. She saw that being strapped into a machine for death was just the last in a series of machines, both physical and social, in which both men and women were trapped. Men had the advantage in being in control of the machines. oss Mr. Jones (Michael Cumpsty) lusts after her and wants her to marry him. Faced with marrying a man she doesn’t love or losing her job, she feels she has no choice but to marry him. By making her future husband her boss at work, Treadwell expands the notions of people trapped by physical machines to that of people trapped by social hierarchies and power structures. Helen’s dread is not alleviated at home because her Mother (Suzanne Bertish) can’t understand why her daughter, who supports her, would forego a life of wealth when it is offered her. Treadwell shows that even at home Helen is boxed in because the conversation between Mother and daughter in their kitchen is surrounded by arguments coming from the apartments on both sides of them. After the episode of her joyless wedding and honeymoon, we next see Helen in a hospital bed. She confounds the staff by her refusal to see her new baby daughter. Here she is at the mercy of another hierarchy since she is subject to her doctors who changer her treatment from one extreme to the opposite seemingly at whim. The first sense of freedom Treadwell gives us is when Helen and the Telephone Girl go to a speakeasy. This is a place where Prohibition is broken in more than one way. The telephone Girl has gone specifically to meet a married man (Arnie Burton) with whom she is having an affair. At the same time (surprisingly for the period), Treadwell depicts an older man (Michael Warner) trying to pick up a younger man (Ryan Dinning). When the Telephone Girl and her man leave, Helen is left alone with the man’s friend (Morgan Spector), who tells her how he freed himself from kidnappers in Mexico by killing their leader with a bottle filled with stones. After an episode showing the afterglow of a sexual encounter between Helen and her Lover, Treadwell gives us a contrasting episode of the arid home life of the woman and Mr. Jones, where the woman becomes obsessed with the image of stones in a bottle. By the time we reach the trial scene, Treadwell has already primed us to see that the court of law is yet another machine. The law machine in turn feeds the press machine that Treadwell shows us turns out exactly opposite accounts of the same testimony. In prison her cell is simply a more explicit cage than was her situation at work and the electric chair is simply another machine to which a person is connected by forces beyond her control. Director Lindsey Turner and designer Es Devlin have had the brilliant idea to make Treadwell’s underlying imagery concrete and turn the set itself into a large machine. It is a huge revolving cube divided into sections. While a scene plays on the front section the back section is loaded for the next scene. The revolution of the cube lends a sense of inevitability to the nine episodes to flow seamlessly into each other. After Episode 2 in the kitchen, the set revolves and we see Helen enter the new front section in her wedding dress, cross the set and exit only to enter again in a different costume in the bedroom set (where the kitchen had been) for the honeymoon scene. The middles section is used for transitional scenes invented by Turner that extend the action of the major scenes. After Episode 5 in the bar, the set begins revolving and we see the two men who had left earlier embracing in an alley. Turner deliberately has the set revolve in a clockwise fashion to reinforce the relentless motion of time, except at one key point. During the trial of Episode 8, Helen has denied any involvement in Mr. Jones’s murder. Once she begins to confess, the sets begins to revolve in a counterclockwise fashion as if now her life is unravelling. The notion is highlighted when Helen is led from her jail cell around the entire cube before the final scene arrive and we see witnesses lined up in chairs looking at her behind a glass window in the electric chair. It is a great pity that on opening night the machinery refused to move after the first scene. That is, of course, the risk that any machine-dependent staging incurs as has happened more than once in Robert Lepage productions. Fortunately, at the preview I attended the set worked perfectly and the coordination between onstage movement and the movement of the set was flawless and hugely impressive. Rebecca Hall gives an extraordinary performance as Helen. For the first five episodes she shows us a woman so beaten down by circumstances that she seems to have lost her will or sense of self. Yet, the brilliance of Hall’s performance is that she somehow lets us know that a seed of hope still exists in Helen despite her expressionless face and lassitude of her movements. We see this seed gradually come alive during her conversation with the Lover in Episode 5 and finally glimpse it in full bloom in Episode 6 after she has slept with the Lover. Hall has mastered all three modes of speech Treadwell has given her. There is the monotone, repetitive speech Helen’s coworkers use; two frightening outpourings of stream-of-consciousness where all Helen’s incoherent feelings of fear and pointlessness pour out of her at once; and then in Episode 6 there is, at last, naturalistic speech that reveals to us the person Helen really is that the Lover, if only for a few hours, has managed to liberate. Michael Cumpsty succeeds in never making Mr. Jones a villain. He is simply a man who doesn’t seek to understand his wife and doesn’t think he needs to. He goes out of his way to supply his own reasons for her odd behaviour. We can understand how living with such an incurious, unimaginative person would be oppressive for Helen, but that is no justification for murder. Morgan Spector is well cast as the dark-haired hunk who becomes Helen’s Lover. He exudes both sexual allure and danger. In Episode 6 in the bedroom, Helen repeatedly misses the cues he gives her that this fling is only a fling not the beginning of a relationship. The more Helen insists that they will always be together the more he pulls away, though in letting her down so easily we can see that he is unintentionally feeding her fantasy of a different life. Suzanne Bertish paints a horrid portrait of Helen’s mother, with selflessness imperfectly masking self-interest. Bertish’s Mother focusses on her instinctive motherly wish to feed her child, yet because the Mother is dependent on Helen, she is willing to push Helen into a loveless marriage. The others in this 18-member cast play two or even three roles each. This is a true ensemble and the cast differentiate their parts so well you might think the cast is even larger than it already is. This is a rare full-scale revival of a one of the few expressionist plays now accepted as an American classic. Those interested in American theatre or in theatre written by women should especially make every effort to see it. The production is so compelling, however, that it should appeal to all lovers of great theatre. Photo: (from top) Rebecca Hall as Young Woman in Episode 9; Rebecca Hall and Ryan Dinning in Episode 2; Rebecca Hall and Morgan Spector in Episode 6. ©2014 Joan Marcus.